Taking inspiration from leading contemporary British artists, Lucian Freud and Jenny Saville, Sophie’s Personal Investigation explores the way that age distorts, changes and adds character to a face. 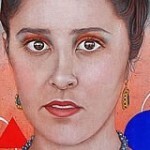 Her project includes painted portraits of herself, her mother and grandmother, with careful attention given to brush strokes and surface qualities. Her project demonstrates the enormous benefit that a student gains when selecting a subject that has a deep personal connection. 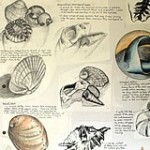 We were lucky enough to interview Sophie about her A Level Art project. Her responses are below. These paintings of her grandfather are complemented with photographs that show evidence of working first-hand. Sophie begins with small areas of the face, using heavy strokes and layered dry brushing, before tackling the face as a whole. 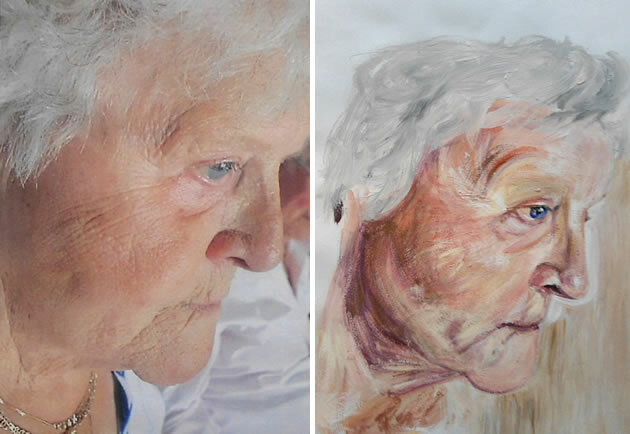 Set upon a pale, lemon coloured ground, the dry brushing helps to create the impression of aged, weathered skin – a stunning example of A Level portraiture. Your Personal Investigation is titled ‘Investigation of Age through Portraiture’. Please talk to us about the ideas behind your topic and why you chose this. This generated the idea to use I, my mother and grandmother as models. Using models that I have an emotional connection with made the portraits both easier and more challenging at the same time. For example, I knew how to portray characteristics nobody else knew except me, but I also didn’t want to be cruel in the way that I painted wrinkles etc. 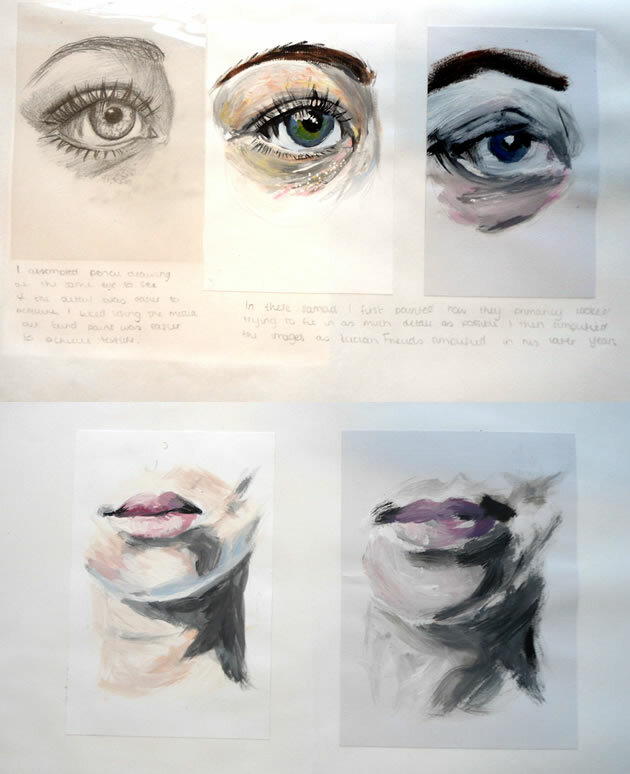 These sketchbook studies show beautiful attention to detail: preliminary paintings of eyes, lips and other facial features, as Sophie practises using different mediums and techniques. 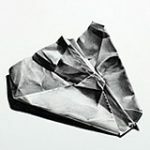 Which artists did you study as part of your project and how did these influence your compositions and painting technique? I knew before even looking at artists the direction I wanted to take, creating portraits which were heavily textured and with a bold use of colour and brushstroke. I chose to look at Freud because I was inspired by the raw way in which he depicts his subjects. 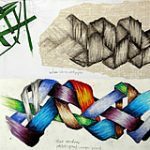 I was inspired by the way he used texture and layers of colour to create a sense of depth in his work. Through looking at his work I understood the way he portrayed personality in his work, which is what I aimed to do in my own. 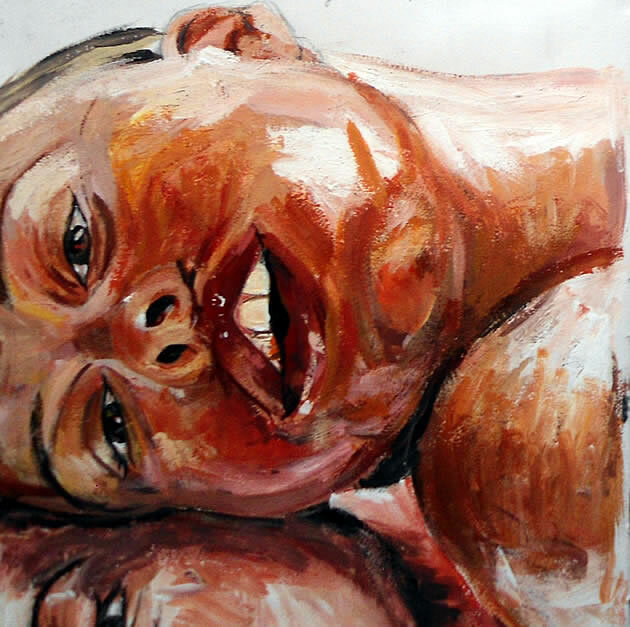 From looking at Freud’s work and learning to paint in his style, I moved on to look at the work of Jenny Saville. 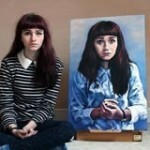 I liked the way that she layered unrealistic colour to achieve depth to her work (much like Freud). I was also interested in the way she distorted the figure and face within her work. Her manipulation and exaggeration of the figure has a raw and disturbing element about it. I was inspired by the way Saville uses such heavy texture and dark colours to create twisted imagery. It took me a while to develop the confidence to do this in my own work though. I would have loved to see some of Saville’s and Freud’s work but I am yet to have the chance (there’s still time for that). 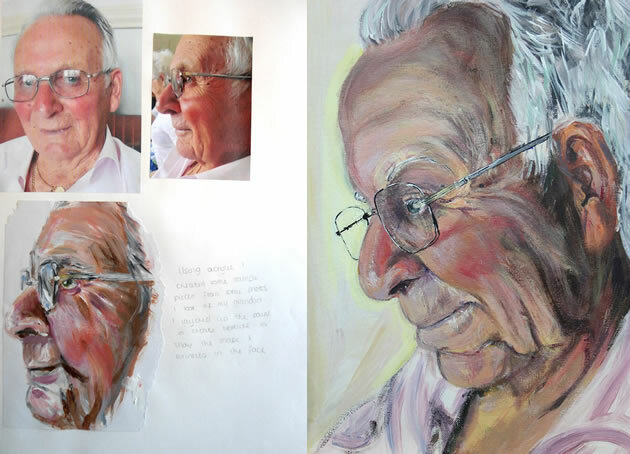 This sequence of A Level Art work shows Sophie’s mother photographed, drawn and then painted in the style of Saville. In this painting, Sophie experiments with using a green coloured ground beneath the skin. 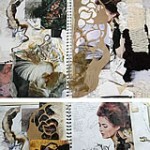 As Sophie’s project progresses, she moves away from realistic representation and embraces more gestural mark-making. 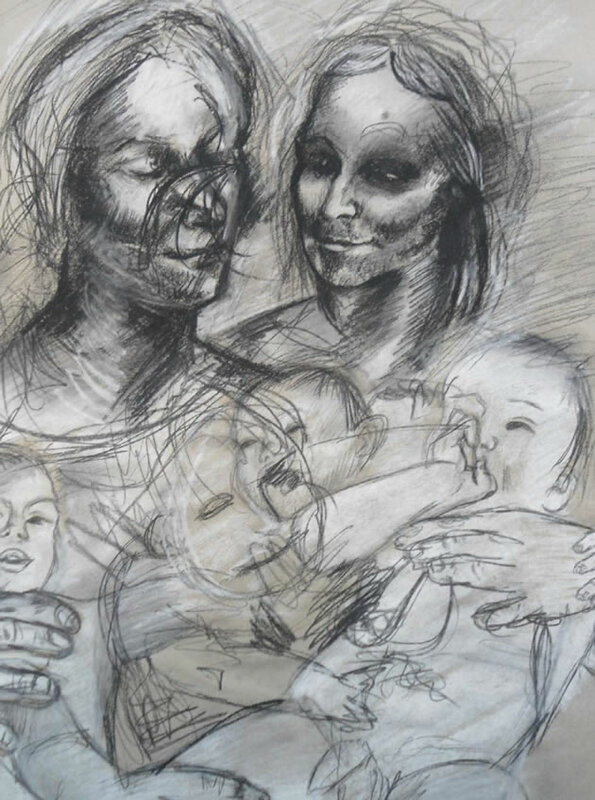 This is an imitation of Jenny Saville’s da Vinci drawing, where Saville overlays sketches of a squirming child upon classical portraits – perhaps hinting at the loss of control and chaos of motherhood. Here Sophie begins to develop her portraits, overlaying images as she explores viewpoints and composition. The bottom painting has been worked over with coloured pencil and is one of the most striking and mature pieces of her A Level submission. Working from her own original photographs of her family, this painting captures the tranquillity and peace in Sophie’s Grandmother’s expression. 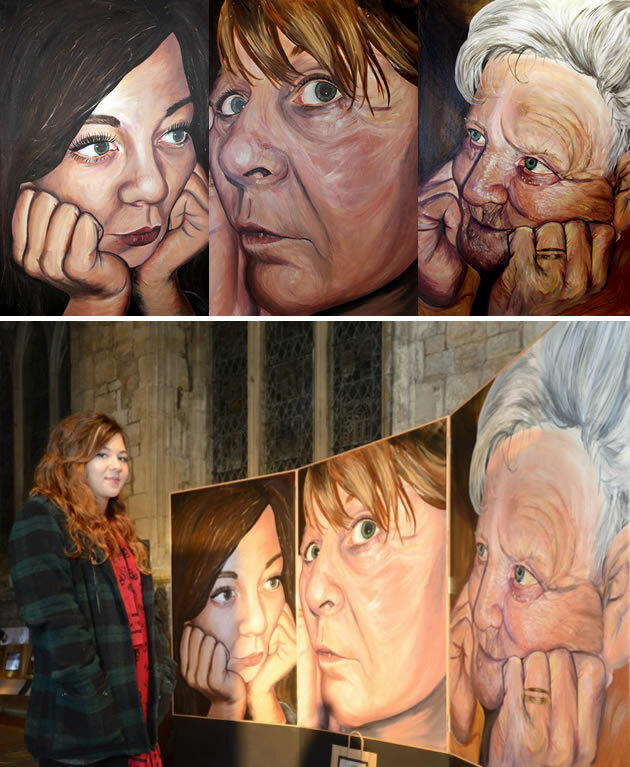 Your final piece is a stunning large-scale triptych that was featured in the Sunderland Echo. 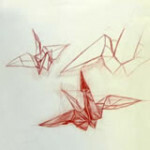 Please talk to us about the decision making process behind this piece. On deciding to create my final piece, I never would have imagined creating such a large-scale triptych. I had never worked at that scale before, so it seemed like it would be quite a daunting experience, but my teacher advised me to work in this scale, to create real statement and I knew that he wouldn’t have advised me to, if he didn’t think I was capable. Using such a close-up of the photographs was simply to draw focus onto the faces. I wanted the eyes in particularly to be realistic and the scale used allowed me to detail them properly. The composition of the images was my homage to Titian’s ‘Allegory of Life’. Where his painting looks out, I wanted mine to create a sense of looking in and personal reflection. Sophie’s project culminates in a large scale triptych, depicting three generations of her family upon huge canvases. The women have similar expressions and positions, with heads resting upon hands, looking in different directions. The stunning conclusion to her A Level Art project also provides an important visual record for her family, which will be treasured for generations to come. 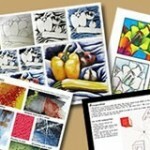 What advice do you have for other high school Art students who wish to gain excellent grades? Well, I don’t know how I would have done it without the help of my art teacher. He helped me progress so much in a year alone, and I think the thing that helped me progress the most was his constructive criticism. So if anyone tells you your work is fantastic and can’t be improved first time around, take the praise and the compliment but don’t be satisfied. Look for faults and actively seek criticism. If you take it constructively and work hard to improve, the praise at the end is far more rewarding than false praise at the start. 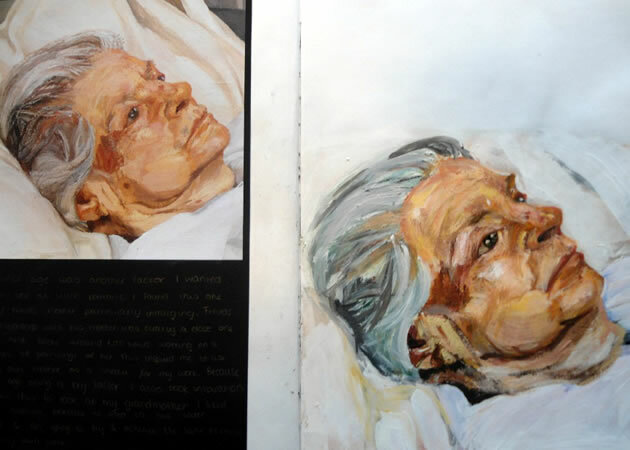 If you have enjoyed reading about Sophie’s A Level Personal Investigation, you might wish to view more of the Featured Art Projects on this website!